​It’s been a while since I’ve seen Joseph and the Amazing Technicolor Dreamcoat. It was back in the nineties when Jason Donovan hit the Dominion Theatre starring as Joseph when the Andrew Lloyd Webber and Tim Rice musical phenomenon was re-introduced to the musical theatre masses, making a huge impact on audiences. Philip Schofield was to take over the role later on, proving that he had more than just presenting skills in his repertoire and since then the show has made its mark all over the world with numerous actors taking on the role of Joseph including Lee Mead, Aled Jones, Donny Osmond and even H from Steps! 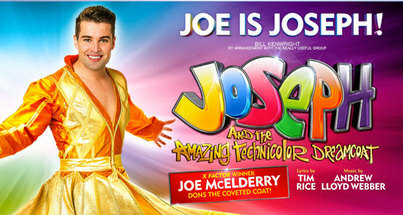 It was no wonder then, that former 2009 X Factor winner, Joe McElderry, had his doubts about taking on the iconic role when he was initially asked; however, he has more than proved his worthiness, having now played Joseph throughout two touring versions of the show and now with this current tour celebrating the production’s 50th Anniversary. It’s all credit to producer and director, Bill Kenwright, that he managed to persuade Joe to take on the role in a show which retains all of it original charm and wonderment. It is also testament to the genius of Andrew Lloyd Webber and Tim Rice for creating a score all those years ago which still sounds as fresh and exciting today. On the Opening Night of this 50th Anniversary Autumn Tour, Joe McElderry rocked the technicolored dreamcoat for all his worth and certainly had no trouble hitting all the right notes. He looked more than at home on stage and took on the role with a comfortable ease. He really has made the part his own, in particular with Close Every Door To Me giving a heartwarming rendition of this song. Despite Joseph being the titular role in this production, the show is very much an ensemble piece and Joe is supported by a fabulous and hugely enthusiastic cast, not least by Trina Hill who plays the hefty role of the Narrator. Trina has a fabulous voice and gives a powerhouse of a performance throughout. From the moment the Overture strikes up and the beautiful voices of the children from the Carmel Thomas Performing Arts school can be heard you know you’re in for a treat. There’s some nice staging which is not too far away from the original production but the wonders of modern technology have afforded the show some additional delights from designers, Steve Cavanagh and Nick Richings. There’s also some nice choreography from Henry Metcalfe in this most colourful piece of theatre. This is the kind of show that can’t fail to put a smile on your face and with half the cast dancing down the aisles of the Cliffs Pavilion after the bows, practically everyone in the audience was on their feet, singing and dancing along to the Joseph Megamix at the end of the evening. Rufus had fallen asleep but his mum told us that he really enjoyed watching the children in the show.